Call-Em-All is a powerful and automated text messaging and voice broadcasting service that has been making thousands of organizations, groups, businesses, and professionals happy, as it provides them with easy ways to reach out and engage with a large number of people. Call-Em-All is being used in different industries and sectors which include education, healthcare, recruitment, property management, waste and utility, nonprofit, and sports. The service combines three tools into a single system, allowing users to deliver pre-recorded voice calls and send out text messages to groups of contacts at once and handle text responses and call results online. Whether users are marketing and promoting new products or services, launching political campaigns, announcing special events, keeping in touch with donors, or notifying people about their appointments or payments; Call-Em-All permits them to take advantage of the service to deliver the right type of messages to the right people at the right time. Call-Em-All’s automated calling system allows users to record, schedule, and automatically send out voice calls and messages to contacts. The system also enables them to check what happened to the voice calls they broadcasted, like if the recipients were able to answer the calls live, calls were routed to voicemails, or when they reached busy lines. 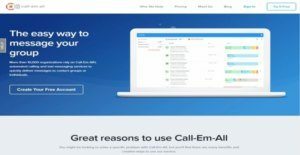 Call-Em-All offers a mass texting system that makes it easy for users to instantly send out important, personalized, and scheduled SMS messages to groups of contacts. They can both prepare messages and manage responses online. The mass texting system stores and organizes text responses in such a way that users can easily keep track of the conversations and the individual recipients who are involved in those text conversations. One amazing thing about this system is that it is device agnostic which means mass text messages can be delivered using any device, whether desktop, laptop, or smartphone. Moreover, it allows the sending of text messages using one’s own business number. There is no doubt that texting is one of the fastest ways to reach out to people. A lot of organizations are using text messaging so they can communicate with people and get responses from them very quickly. Call-Em-All makes text messaging more powerful because it has a mass text messaging system that automates the process of sending out text messages to individual contacts or groups of contacts. Call-Em-All eliminates the need to send text messages to contacts one at a time which is of course very time-consuming. Call-Em-All automated mass text messaging system permits users to perform three actions which they can do all online – prepare and schedule text messages, monitor text responses and results in real time, and handle text conversations. The first action allows them to prepare text messages by simply typing in SMS messages using a browser from any type of device, be it desktop, laptop, or smartphone. They can enter any type of message they want for whatever purpose like launching recruitment campaigns and reaching out to potential candidates, sending out announcement and updates for school-related activities and events, communicating with members of a religious organization or community, collecting donations for fundraising activities, promoting new products or services, or launching political campaigns. Text messages can be sent out to each individual contact or groups of contacts. If the text messages are urgent, users can deliver them right away. They can also schedule text messages if they prefer to deliver text messages at a later time or date. The second action provides users with the capability to track text results in real time. Thus, they will be able to find out if contacts replied back to the text messages they sent out, how many text messages were able to get a response and pinpoint the text messages that were delivered to the mobile, landline, or invalid numbers. One great feature included in Call-Em-All is that it makes it very easy for users to track and manage text responses. In fact, the system keeps and organizes text responses as text conversations. This means they will be able to verify the exact times or dates when the text responses were delivered and the individual contacts who sent them, allowing them to can keep track of the entire history of a particular text message. As Call-Em-All automates the sending out of text messages to individual contacts or groups of contacts, it also makes broadcasting voice calls and messages automated. With its automated voice broadcasting or calling system, users no longer need to call their contacts one at a time, as what can be observed in traditional phone systems. So how does this system work? The voice broadcasting system enables users to set up their contacts along with all their phone numbers within the system by uploading CSV or XLX files instantly or entering each piece of information manually. Then, Call-Em-All permits them to produce a pre-recorded voice call or message. They will be able to do this by using the Call-Em-All’s toll-free line, uploading a voice recording, or choosing a voice recording from Call-Em-All’s built-in message library. Like text messages, voice calls and messages can be scheduled as well so that they are delivered to the right contacts at the right time, preventing users from interrupting contacts with hectic schedules or those ones that are currently engaging in some important business or family activities. The mass messaging service offers valuable features. For instance, users can set how fast voice calls and messages are being delivered to contacts. They can specify the maximum number of calls that should be sent out per minute. This is to ensure that users won’t have a hard time handling callbacks. Call-Em-All also automatically detects voicemail systems. If a voice call or message reaches a voicemail system, it immediately plays back the recording so the voicemail system can capture the message completely. Call-Em-All makes it possible to keep track of the statuses, results, and details of broadcasted calls. It enables users to determine what happened to the calls they delivered, allowing them to find out the number of calls that were answered live by contacts, reached voicemail systems and delivered to busy lines or invalid numbers. The mass messaging system is very useful for sending out various type of reminders. Whether users want to notify their contacts to remind them about matters related to events, appointments, payments, or timesheets, Call-Em-All automates the way they deliver important reminders to their contacts, helping them save more time and keeping contacts in the loop. They can access text templates and customize them by inputting any information they want like names, dates, numbers, and other details. This way, they will be able to add a personal touch to every text message they are sending. In case they are sending out reminders through the automated call system, contacts can call them back right away by simply pressing a key on their mobile phone. There are well-liked and widely used systems in each software group. But are they automatically the best fit for your organization’s unique requirements? A popular software product may have thousands of users, but does it provide what you require? For this reason, do not blindly spend on popular systems. Read at least a few Call-Em-All reviews and think about the factors that you want in the software such as the cost, main functionality, available integrations etc. Then, select a few systems that fit your wants. Check out the free trials of these apps, read online reviews, get clarifications from the maker, and do your homework systematically. This in-depth homework is certain to help you find the best software solution for your company’s unique requirements. How Much Does Call-Em-All Cost? We realize that when you make a decision to buy Mobile Marketing Software it’s important not only to see how experts evaluate it in their reviews, but also to find out if the real people and companies that buy it are actually satisfied with the product. That’s why we’ve created our behavior-based Customer Satisfaction Algorithm™ that gathers customer reviews, comments and Call-Em-All reviews across a wide range of social media sites. The data is then presented in an easy to digest form showing how many people had positive and negative experience with Call-Em-All. With that information at hand you should be equipped to make an informed buying decision that you won’t regret. What are Call-Em-All pricing details? What integrations are available for Call-Em-All? If you need more information about Call-Em-All or you simply have a question let us know what you need and we’ll forward your request directly to the vendor.